Seton Hall Univ Catholic Studies Dept High School Essay Contest. 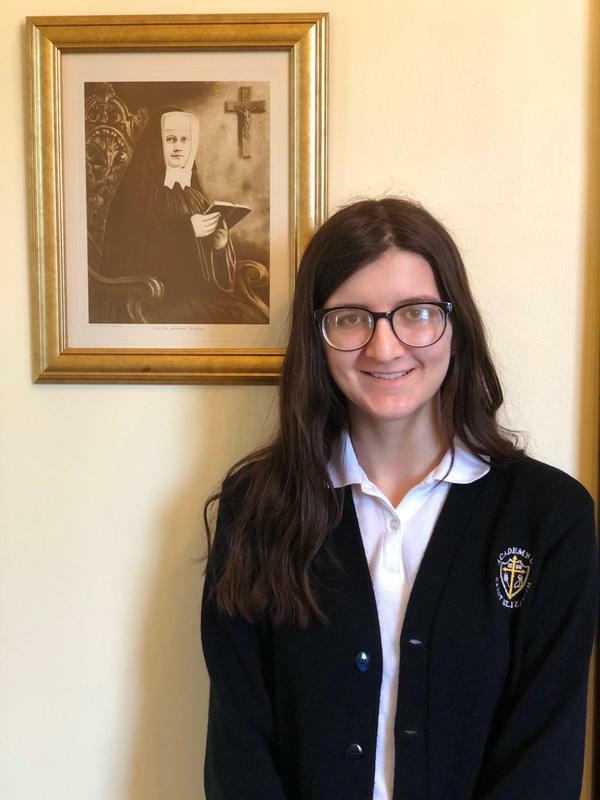 Academy sophomore Molly McKenna is the first runner-up in the Seton Hall University Catholic Studies' essay contest. This year's essay topic was How Does a Saint Inspire You to Live the Faith Today? Molly is pictured above next to a portrait of Sister Miriam Teresa, the inspiration for her winning essay. Molly's work is going to be published in Arcadia: A Student Journal for Faith and Culture. This contest is open to all student in grades 9-12 in New Jersey Catholic high schools. It is an extraordinary achievement for Molly to secure this spot as a sophomore. Congratulations to Molly on the beginning of her career in print. Seton Hall will host the McKenna family for a celebratory mass and reception next month.